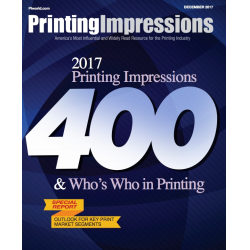 The Printing Impressions Top 400 is the industry’s most comprehensive list of the leading printing companies in the U.S. and Canada ranked by annual sales. Modern Litho, Inc. (which includes four subsidiaries) has risen 11 spots from #169 in 2016 to #158 in 2017. The printing industry, like so many other industries, continues to evolve and find relevance among technological advancements. This year’s list reveals growth for companies with a strong presence in direct mail marketing, wide format and packaging. “Several of the large players have consolidated or sold in 2017 further concentrating the industry – a testament to what we’ve known for a long time. If you’re not investing, you will soon be out of the game,” said Jeff Davidson, Vice President at Modern Litho.